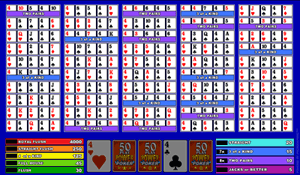 Microgamings Jacks or Better 50 Play Power Poker is different from a standard video poker as you play fifty hands of cards at the same time! Not bad eh? There are no wild cards and the maximum payout is 4,000 coins so plenty of coins to be won. Be advised that Microgaming powered casinos do not accept all USA residents and as such we would suggest you play at any of the casinos listed below where you are assured a warm welcome.